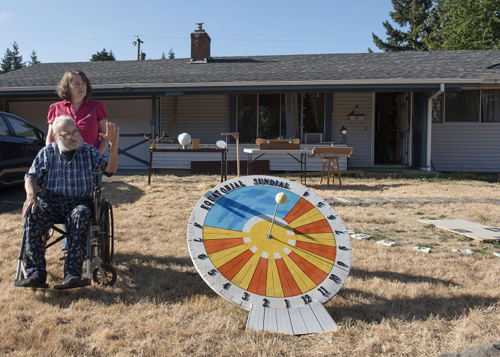 He may be wheelchair bound, but that doesn't diminish Tom Laidlaw's enthusiasim for sundials. In front of his house on Carolina Lane is the Vancouver Heights neighborhood landmark - a sundial garden. And what has he planted? Katie Gillespie, of the Columbian, reports "The 80-year-old retired electrician has always been a 'do-it-yourself kind of guy,' he said. For a while, it was skateboards he fancied, and bookshelves, and a Benjamin Franklin chair that transforms from a chair into a stepladder. He’s self-taught, he said, researching new projects online, then diving in.... 'It’s fun to watch him talk to people about it,' said Debra Brouhard, Laidlaw’s daughter and neighbor." His latest obsession is sundials. As a member of the North American Sundial Society, Tom now designs a multitude of sundials. Visitors see his yard dotted with all types of sundials. They come in all sizes: big and small. His analemmatic sundial on the lawn always draws attention. Nearby, a plumb bob dangles from a beam. allowing Tom to tell time solar noon. when the shadow draws a line on the lawn pointing due north. 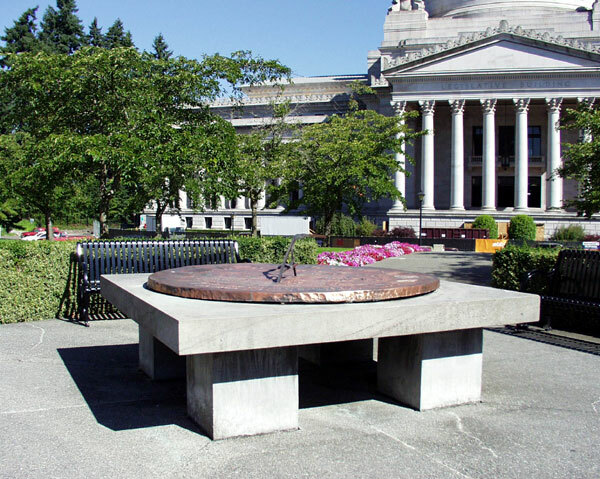 Gillespie found that, "Laidlaw’s passion for sundials began in 2009, when his grandson, Doug Brouhard, stuck a stick in the ground while they were camping. Doug Brouhard was about 12 at the time, and the dial didn’t quite work, Laidlaw said. It was the right idea, though, and a new hobby was born. 'I still have the stick that started it all,' Doug Brouhard said." 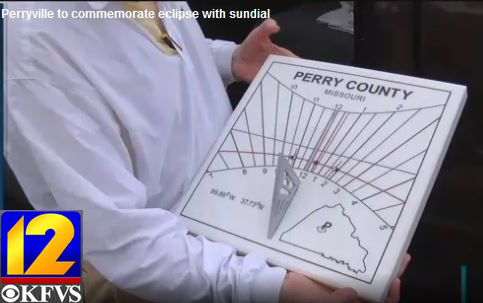 In Perryville, Missouri, Perry County unveilled a sundial commemprating the coming August 21st total solar eclipse. Mike Mohundro, Photojournalis for Hearland News (KFVS Channel 12) interviewed Trish Erzfeld, Perry Count Heritage Tourism Director, who said "We just wanted something after the eclipse is over with that the community can be proud of and reflect back on." Mohundro went on to write "many organizations worked on this project together including Earthworks, the [North] American Sundial Society, St. Louis Stone Artist Abraham Mohler, Perry County and more." 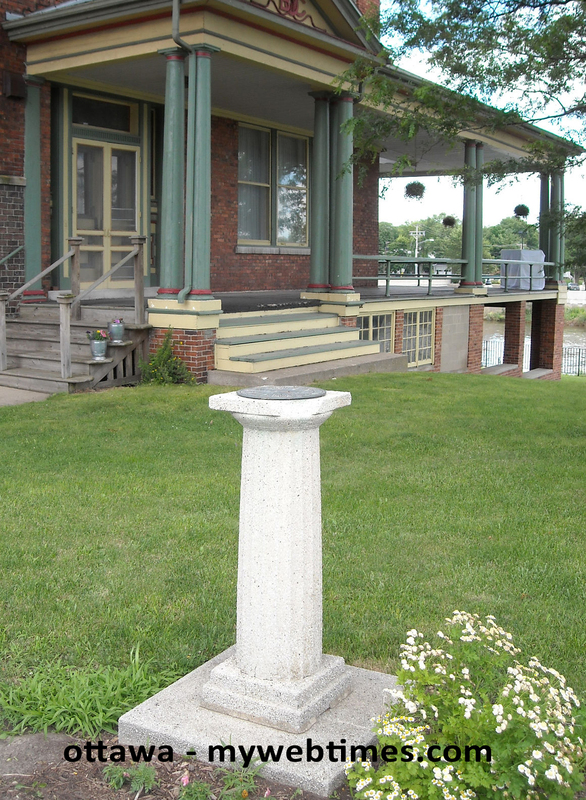 The sundial, shown in a KFVS video and in the photo at right, is a horizontal white milk glass sundial now mounted on a large marble pedestal (watch the dial video at http://www.kfvs12.com/story/35969739/perryville-to-commemorate-eclipse-with-sundial). On the pedestal are three plaques, one entitled "Time" explaining how to convert the sundial's solar time to civil time as told by watches and cellphones. 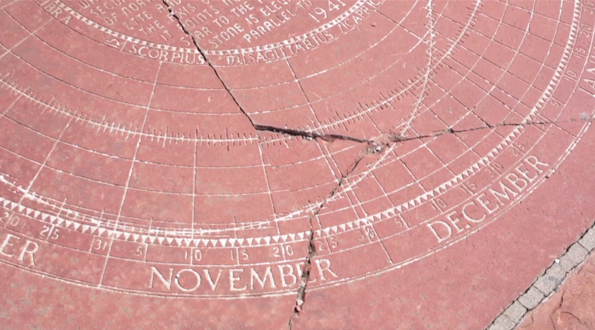 "Not a lot of people know how to read a sundial," Erzfeld said. "It's a teaching tool as well as a historical marker here on out." The second plaque entitled "Eclipse" shows the date and time when the August 21st eclipse starts and stops as seen in Perryville said Don Snyder, local member of the North American Sundial Society. The third plaque "Sundial" indicates who was involved in creating the dial. Mohundro quotes Erzfeld saying "Education is been our main focus through this whole solar eclipse even... There's just so many things that play into the science of it and a sundial is one of those things that people can learn from." 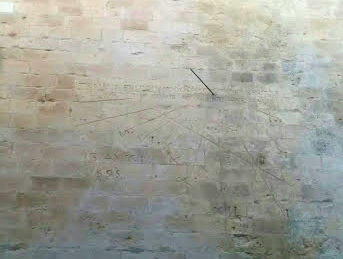 A sundial that only tells time during an eclipse? Back in 2012 Bill Gottesman designed a peculiar dial to tell time by observing the angle between the cusps of the sun during the May 2012 eclipse. Bill Gottesman is back at it with a more sophisticated version assisted by programmer Dan Axtell. This time Bill and Dan give you an animated version of the cusp line, as well as detailed information of the line angle during the eclipse. This is for anywhere in North America that can see the partial or total eclipse. 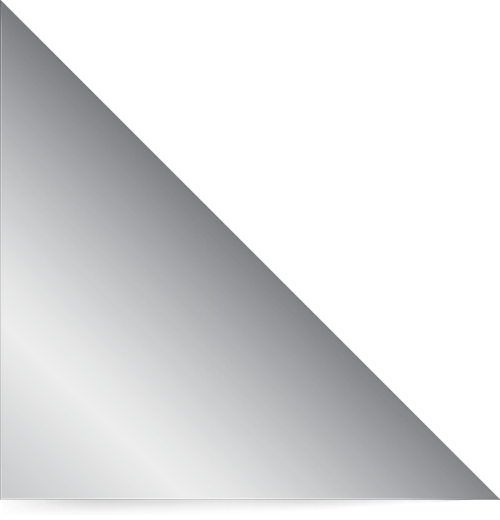 Just enter your latitude and longitude and let the software create you a personal solar eclipse sundial. PLEASE DO NOT OBSERVE THE SUN DIRECTLY WITHOUT AN APPROVED SOLAR FILTER... OR, MAKE A SIMPLE PINHOLE CAMERA FROM A CARDBOARD BOX.